Rest up, New Horizons – you have a busy 2015 ahead. NASA’s Pluto-bound spacecraft was put into hibernation this morning, following a successful 10-week annual checkout period. Mission controllers at the Johns Hopkins University Applied Physics Laboratory in Laurel, Maryland, verified that New Horizons entered hibernation at 9:21 a.m. EDT. With New Horizons now beyond Neptune’s orbit – more than 2.75 billion miles from Earth – that signal needed just over four hours to reach the mission operations center through NASA’s Deep Space Network. Did you know? Before New Horizons enters hibernation, its main antenna is pointed to where Earth will be the next time the spacecraft wakes up. This allows operators to gather data on the spacecraft’s condition immediately upon wakeup, without having to fire thrusters to reposition New Horizons. Checkout work ranged from refreshing the processors on the spacecraft’s computers, to testing the sun sensors New Horizons uses to automatically determine its position in space, to uploading the final version of the autonomy software that will guide collection of and protect the data New Horizons collects during Pluto close approach. The team also checked the spacecraft’s primary and backup operating systems as well as all seven scientific instruments – and calibrated the instruments to gather “cruise science” data that includes a distant examination of the surfaces of Pluto and its moons early next year. Last month the Long Range Reconnaissance Imager was used for the first optical navigation campaign – snapping images that helped the team home in on Pluto – and the navigation team continued to track the spacecraft to refine its orbit. New Horizons is scheduled to come out of hibernation on December 7; it then stays awake for two years of Pluto encounter preparations, flyby operations, and data downlinks. 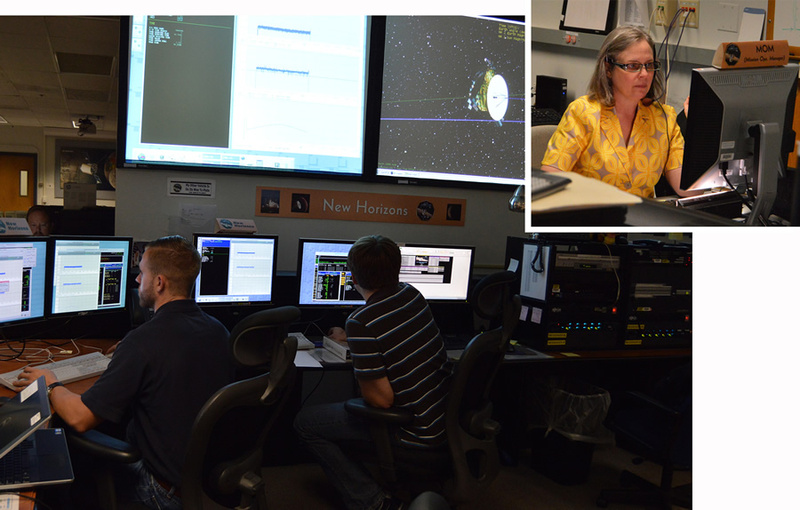 Distant-encounter operations at Pluto begin January 4, 2015. Flight controllers Mike Conner and Josh Albers, in the New Horizons Mission Operations Center at the Johns Hopkins Applied Physics Laboratory, await the signal confirming the spacecraft’s entry into hibernation on August 29; (inset) mission operations manager Alice Bowman keeps an eye on spacecraft telemetry and the communications link between New Horizons and NASA's Deep Space Network.